Valentine’s Day is a day to let your loved ones know how much you love them – and it is also a day where florists and candy shops are overflowing with people picking up last minute boxes of candy and bouquets of roses at premium prices. If you want to avoid the crowds and high prices, stay home and make something for your Valentine, instead. There are plenty of wonderful, edible treats that don’t take much time to make and say “I Love You” even better than a bunch of overpriced roses. Serving up a Valentine’s Day Eggs in Toast – pictured above – is a great way to start the day. 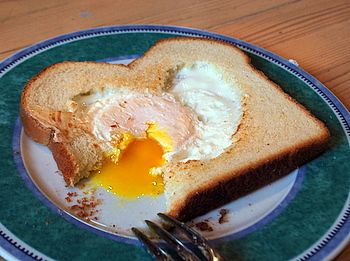 For this dish, you cut a heart out of a piece of toast, place the toast in a hot pan and crack an egg into the center. It’s easy to make and looks beautiful on a plate. Instead of spending money on truffles from a chocolate shop (especially if you don’t have a great one in your area), make your own truffles at home. Dark Chocolate Truffles are easy to make and oh-so-delicious. 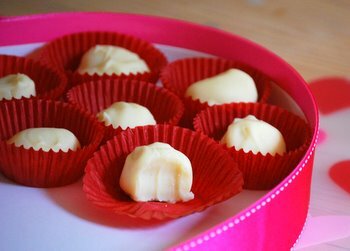 If you are more a white chocolate fan, or want some contrast in your chocolate, try a batch of White Chocolate Truffles that are infused with vanilla bean. 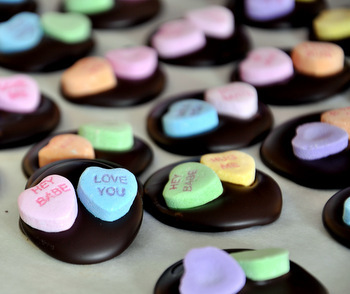 Conversation Heart Mendiants are another chocolate treat that is perfect for the holiday, since they are topped off with those iconic conversation heart candies. You can really customize these to have a message for your Valentine – such as the romantic and timeless “Soul Mate” or the modern “LOML” (love of my life). I noticed at the grocery store (not even at a “premium” chocolate shop) that they were charging more than three dollars for a single chocolate dipped strawberry in the few days leading up to Valentine’s Day. Milk Chocolate Dipped Strawberries are an amazing treat that you can make yourself, and you can get a whole basket of berries for the price you might pay for just a few berries elsewhere. Once they’re dipped in chocolate, you can add nuts, sprinkles or anything else you can think of to dress them up even more. 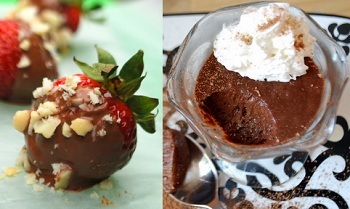 Chocolate Mousse is a dessert that you might share after a nice dinner out on Valentine’s Day, since it is one of those treats that gets labled a “special occasion dessert” instead of an everyday indulgence. 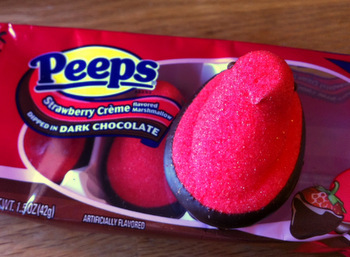 Fortunately, it is another treat that is easier to make at home than you might think. A Classic Chocolate Mousse should be rich and decadent, just like this one – and it just might be the perfect way to end a wonderful meal or finish off an evening with a loved one.